Dietary supplements often taste bad or do not have the right ingredients in them to help make your skin glow and your hair and nails look beautiful from the inside out. So makeup artist extraordinaire Bobbi Brown wanted to change all of that. She founded EVOLUTION_18, which promotes good health from the inside out that starts with the right dietary supplements. Her lifelong philosophy has always been that beauty and confidence starts with what you put into your body. The launch of her lifestyle-inspired wellness line, EVOLUTION_18, is a natural extension of Beauty From the Inside Out and a testament to her commitment to living a holistic lifestyle. After spending over 25 years talking to women about their health and wellness challenges and now as a certified health coach with the Institute for Integrative Nutrition, Bobbi understands what we need to look and feel our best. These products were created to improve overall health and fit into any lifestyle. She has created several formulas to go with your lifestyle and help you be the best self you can be. There is De-Bloat, a antioxidant-infused powder formula designed to do just that, get rid of that bloated feeling and is the perfect remedy for when you need to fit into that little black dress or just the reset button. De-Bloat helps deal with water retention by flushing out extra fluid while leaving you feeling energized. Taken daily or as needed. 15 calories per serving. Overnight Vanilla is a creamy drink made with real Tahitian vanilla and infused with patented collagen peptides, biotin, hyaluronic acid and coconut oil to boost skin’s hydration and elasticity. Added magnesium works to calm the mind and body so you can get a good night’s sleep. Is 60 calories per serving and contains tree nuts. quick melt probiotic with 10 billion live cultures plus essential prebiotic fiber that works to support digestion and nourish a healthy microbiome. With a natural lemon flavor, this powder dissolves quickly and begins working immediately. coconut milk or almond milk or add it to your favorite smoothie for an energy boost that fills you up. Add one scoop to 8 ounces of water or milk and mix thoroughly. Serve hot or cold. Afternoon Chocolate serves as a complete protein source that nourishes muscles, supports brain function and leaves you feeling satisfied. Healthy fats from coconut medium-chain triglycerides provide an energy boost and curcuminoids from turmeric encourage a healthy anti-inflammatory response. This antioxidant and amino acid rich drink is sweetened with monk fruit and is formulated with essential prebiotic fiber to support your digestive system. Gluten-free and soy-free. In fact, the ingredients list is very small: grass fed whey-protein, coconut medium chain triglycerides, curcumin, cocoa, product nutrition label. Cocoa is rich in antioxidants and cocoa also provides the perfect amount of sweetness and flavor. Coconut Medium-Chain Triglycerides (MCTs) are healthy, appetite satisfying fats that provide an energy boost. Curcumin, found in turmeric, an herb that has been used since ancient times in the Ayurvedic herbal tradition, this chemical promotes a healthy anti-inflammatory response throughout the body. I happen to really enjoy the Afternoon Chocolate flavor. I don't like it mixed in with water. I do like it mixed in with almond milk or made as a smoothie. It tastes delicious, kind of like a chocolate malted. I also enjoy it with milk, mixed into a smoothie. I would really like to try the De-Bloat. As I always feel bloated. These supplements are something I think I could see myself purchasing in the future because of all of the nutrition and wellness factors that goes into making them. I like nutrition. and it is hard for me to get all that I need from my diet. 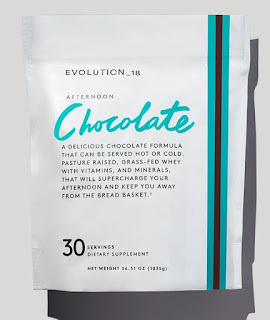 EVOLUTION_18 Afternoon Chocolate is available online at www.evolution18.com. Like EVOLUTION_18 on Facebook: https://www.facebook.com/EVOLUTION_18-209755736272482/ and Follow EVOLUTION_18 on Instagram: https://www.instagram.com/evolution_18/.